Pay close attention to this public announcement… No, I’m not going to enlighten you with my coffee obsessions, travel stories, cycling rants, foodgazims or Melbourne commentary but, if you like all of those awesome things about my site then head here to vote for me, the global rambler for People’s choice Best Blogs 2014. Since 2011 the Australian Writers’ Centre praise their members, followers, admirers and the like by running this wonderful competition for Aussie bloggers. In association with Trafalgar and Random House Australia, competition winners – all bloggers in the sphere – are lucky enough to receive cash, publishing deals, mentoring and of course loads of writing courses and BOOKS! 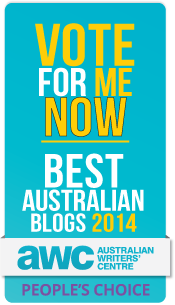 So show your support for Aussie blogging and head to the site to cast your vote for me, the global rambler. ← Harlem… Where is the Ghetto?